What Makes a Great Mobile Experience? The stakes for creating a great mobile experience are getting higher. Consumer usage of mobile has surpassed the desktop, and according to comScore, smartphone adoption in the United States is surging, meaning that brands need to think mobile just to keep up with consumer behavior. And Google recently sent a strong message about the importance of mobile with the launch of the recent algorithm update that rewards mobile-friendly websites in search. But engaging with customers on mobile means more than building apps and pushing mobile ads. You need to create experiences that adapt to consumers who use their devices to interact with your brand on the fly. 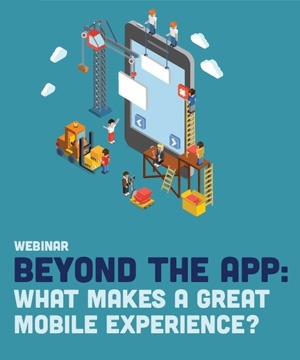 On May 19 at 1:00 p.m. EST, my BeyondCurious colleague Vishal Agarwal and I will help businesses understand the key attributes of creating a successful mobile experience as we host a BeyondCurious/Digiday webinar, "Beyond the App: What Makes a Great Mobile Experience?" You may register to attend here. How to evaluate the differences between mobile apps and mobile Web. How to approach mobile experience development. How to engage your mobile audience. As an innovation agency, BeyondCurious creates mobile experiences that empower people and transform brands. On May 19, our goal is to empower you with new insights about getting started with great mobile customer experiences. I hope you'll take an hour out of your day to join us by registering. Talk with you May 19.